Grasshopper Manufacture is a Japanese video game developer founded in 1998. It's headed by Goichi Suda, aka Suda51. 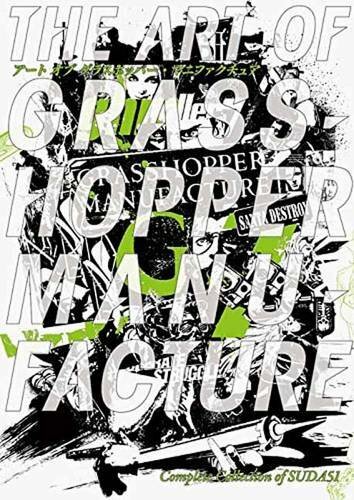 The Art of Grasshopper Manufacture is the portfolio artbook that showcases the video games that have been produced since 1998. This includes the first debut game Silver Case up to the 2015 release Let It Die. It's pretty cool to see such a wide variety of game concepts from a single studio. As expected from a Japanese company, some of the ideas are really out of the world. Grasshopper Manufacture is a company that does not shy away from making obscure and less mainstream games, another way to describe them would be that they make imaginative and creative games. Of the games featured, I only heard of No More Heroes and Lollipop Chainsaw. Many of these games are not ported over to English for overseas market. The art and style is good and varied. However, as the games are not arranged chronologically, the order is a bit messy. What you'll see predominantly would be character designs, followed by the environments. The book is in Japanese and English. Each game has an introduction and profile, but the English text are only found at the back of the book. There's quite a lot to read if you like game development stories. It's a nice book but I suppose it's going to appeal more to those who have played the games, or fans of Grasshopper Manufacture. As a standalone artbook for those who have no idea of the existence of Grasshopper Manufacture, it can be a strange sample of game art.